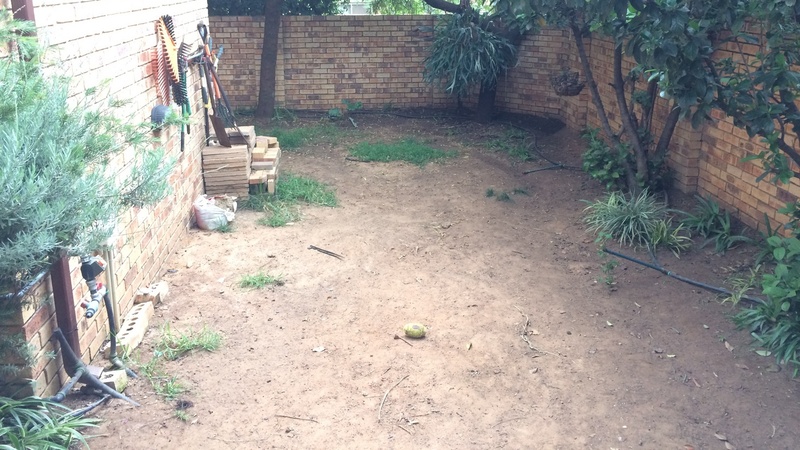 Over the years we’ve visited hundreds of gardens in Gauteng, and have had the opportunity to experience first-hand the many problems that home owners face with regards to their gardens. In most cases the problems we encounter are not unique, and are experienced by many other home owners. Often these problems have simple solutions, so long as the home owner is willing to take the necessary steps to solve them. In others however, such as trees breaking boundary walls, there may be costly expenses involved to remove the problem tree and repair the wall. 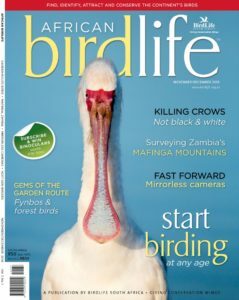 In this article I want to cover some of the common problems we encounter in gardens, and how they can be solved. If you have an existing problem perhaps you might find a solution to it here. Or, if you’re just starting out with a new garden, perhaps you can read through this list and avoid some of the common problems that have plagued other home owners. Please keep in mind that we’ve had to use our discretion as to how to ‘define’ the problems, because some of these might simply be symptoms of a larger issue; A plant suffering from a fungus or disease, for example, might be seen as the problem, or it could be the symptom of a garden that is being over-watered. Additionally, there is often an over-lap between problems. Poor drainage, for example, often goes hand-in-hand with insufficient groundcovers or poor gardening practices. To this end I’ve tried to be as logical as possible in my approach to the list, and as always would welcome your feedback on the items you feel might need further explanation, or perhaps other problems you feel should be included. This Searsia lancea, planted too close to a boundary wall, has already had to be cut in half, and is lifting the paving. 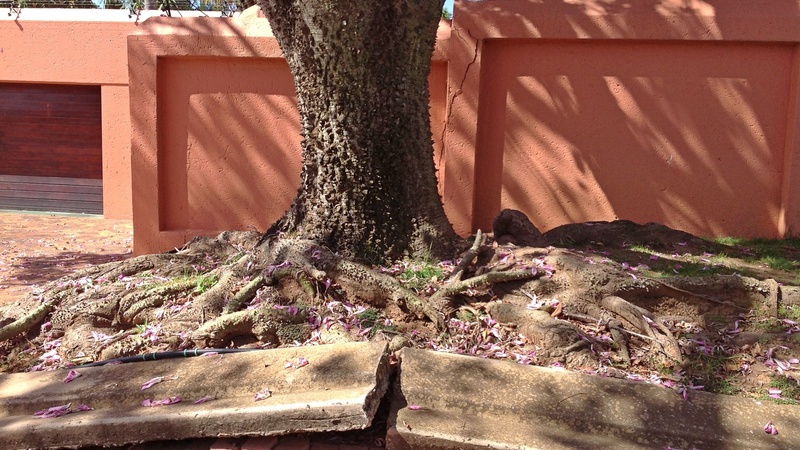 Arguably the most common problem we find in gardens is poor tree selection and placement, often resulting in damaged boundary walls, the lifting of paving, or tree roots that interfere with house foundations. Unfortunately, it is all too tempting to place a young tree close to a boundary wall, either because the bed is not large enough, or because the home owner needs ‘instant’ screening from the neighbours, and does not take into account the full-grown height and width of the tree. From experience we know how difficult it can be for a home owner to plant a tree even one meter away from a wall – because the tree is still deceptively small, or because the home owner doesn’t want to use up too much lawn space. Often these trees become problems for the neighbours too, and the world of gardening is littered with disputes between home owners and their neighbours over the trees on their boundaries. 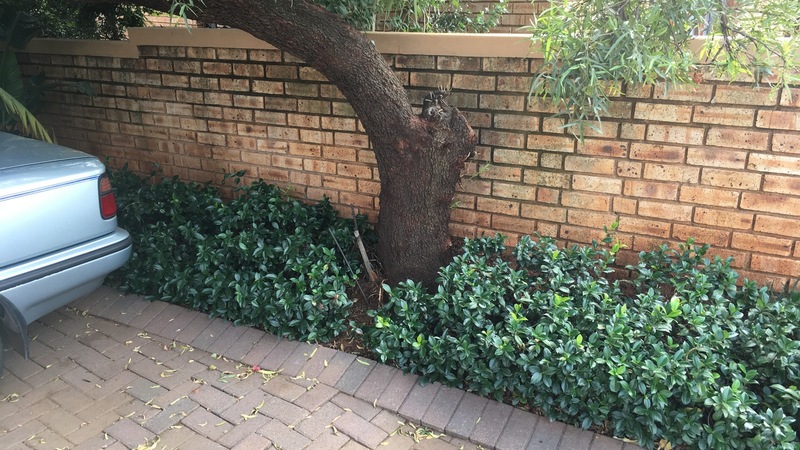 If you have a tree that is starting to affect a boundary wall, be proactive and remove the tree, or transplant it if it is still young enough. For new trees take into account the full-grown height and width of the tree and plant it accordingly. 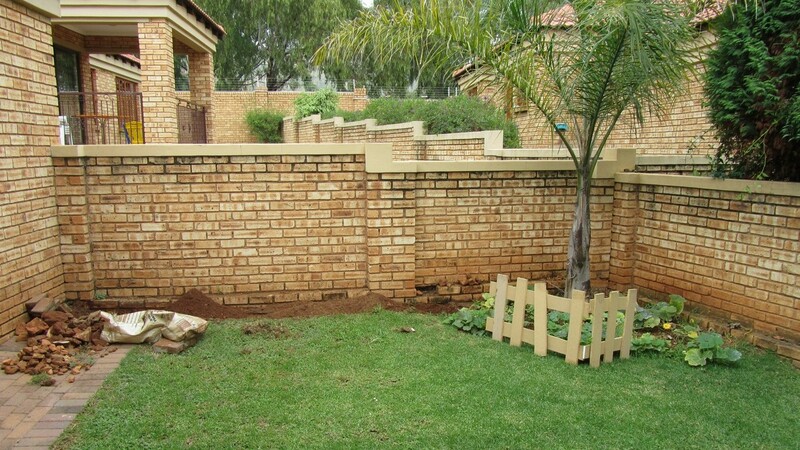 For small trees we would recommend a distance of at least 1.5 meters from the boundary wall, whilst larger trees should be planted at least 4-7meters away from walls and foundations. 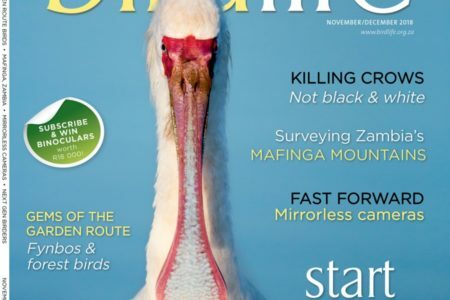 For further reading browse to our “Trees breaking walls” or Top 10 trees articles. Perhaps the most common, costly and damaging gardening practice I see in gardens is the turning of the soil. 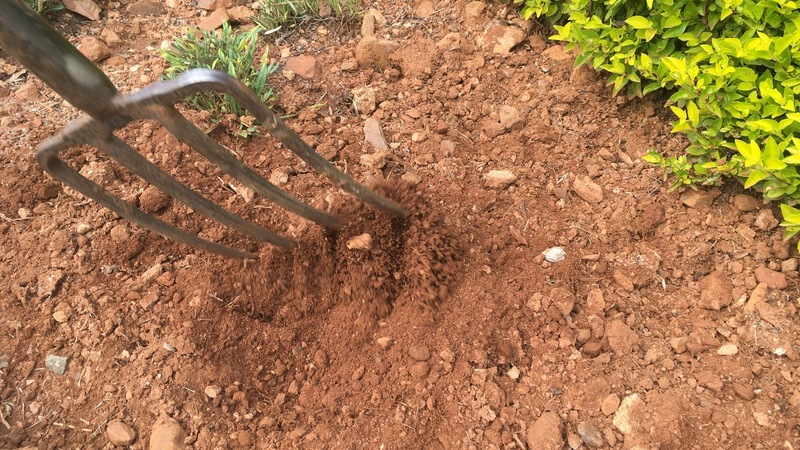 Otherwise known as ‘cultivating’, ‘forking’ or ‘digging’ the soil, this practice dates back many years when it was promoted by gardening experts as a way of ‘aerating’ the soil. It is only recently – perhaps in the last twenty years – that experts have begun to question this practice, and to realise that it does more harm than good. 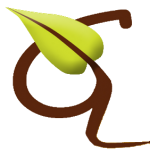 The result now is that turning the soil is being accepted as an incorrect gardening practice, and alternative gardening methods are being taught to gardeners and in universities. Unfortunately, it is (and might be for many years) a practice that is entrenched in the minds of many home owners, either because they still believe that it aerates the soil, or because it makes their beds look ‘neat’. 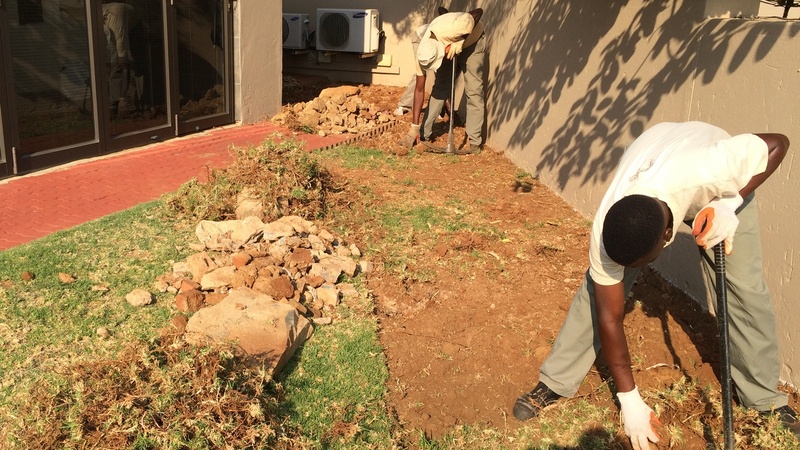 Even garden maintenance teams are sometimes forced to ‘cultivate’ the soil because it is stated as such in their contracts. The fact is that the soil is a complex ecosystem, teeming with microorganisms which help to provide nutrients to your plants. Turning it exposes these organisms to air and heat, which kills them, and slowly results in the deterioration of your soil. Not only does this compromise your plants, but it can harden the soil and lead to drainage problems, soil erosion or dust around the home. Instead of turning the soil, home owners should work towards protecting it, by adding compost and a layer of mulch, by planting groundcovers, and by leaving leaves in the beds instead of raking them up. Work on the soil is then up to earthworms, microorganisms and insects which break down the leaves and larger particles and help turn them into compost, thereby providing more food for your plants, and a healthier growing medium. If small weeds are found in your garden they should be removed by using a weeding tool – available at most DIY outlets – and not by forking them. In short, if we estimate how much time is spent daily by gardeners around the country in turning the soil, and how damaging the practice is, then one can appreciate the scale of the problem and how costly it is. Do yourself a favour and embrace the natural processes that mother nature has provided: groundcovers, falling leaves, aeration and decomposition by earthworms and microorganisms, and you will be on your way to a healthier, flourishing garden. I have always tried to promote the idea of lawn-free gardens, gardens which increase the biodiversity of our country and lower your maintenance costs. But lawns do have their place, and many people could not conceive of a garden without some lawn to lie on, walk on, or play games with their kids on. Lawn, however, is likely to be your highest maintenance plant – not to mention your thirstiest – and there are a number of lawn problems which we frequently encounter. One of those is lawn that is struggling in the shade. Almost invariably, these lawns are (or were) Kikuyu, a sun-loving species which slowly dies off in shady areas. 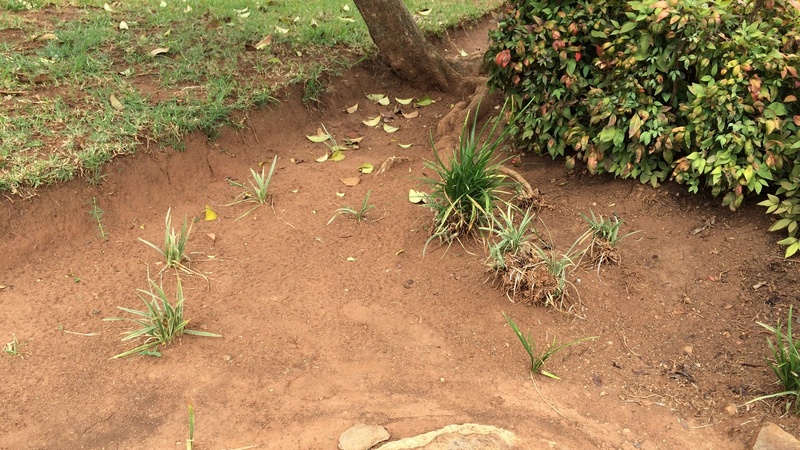 If you have Kikuyu which is struggling in the shade, one solution is to cut back the trees and shrubs surrounding it, in order to provide it with more light – although this tends to be temporary and is usually an ongoing process. Alternatively, one can use LM or ‘Berea’ lawn, an indigenous species that takes time to establish itself but is fairly hardy and knits well together with the Kikuyu. LM, however, only works in semi-shaded areas (rarely in full shade), and does not take heavy traffic very well. Other ‘shade-lawn’ species may have limited lifespans, and homeowners who try them often end up having to repeat the seeding or planting process year after year. If, after trying LM, you still find your lawn struggling in a particular area – and you are not willing to cut away trees and shrubs – then it might be time to realise you are trying to ‘fit a square peg in a round hole’. In these instances, consider removing your lawn and extending your beds, using shade loving groundcovers or bark chips instead of lawn. Some of our favourite gardens are those with no lawn at all; shaded hideaways where home owners have been creative in providing access without the need for sun-loving lawns. Converting your lawn into an indigenous bed is both rewarding and liberating, and will allow you to appreciate a greater diversity of plants, whilst eliminating one of the most common garden problems. Weeding is perhaps a gardener’s least favourite job, and yet it is one of the most important. Weeding, if done proactively, is a simple process, but requires knowledge of what is a weed and what is not, especially if a garden has been newly planted. Weeds in the lawn is one of the most common problems we encounter, and if left unattended, can render a lawn unrecoverable and requiring a complete and costly overhaul. Home owners need to be proactive in checking for weeds in their lawns, and removing them as and when they see them. Keep in mind that garden maintenance teams can unwittingly bring weeds into your garden, transferred from other gardens via their equipment. Weeds in your beds can also become major problems, especially if they are the seedlings of alien invasive species. In most cases these weeds are brought in by birds or on the wind, which is why weeding will always be an ongoing requirement in your garden. The most common species to look out for include: Privet, exotic Celtis sp., Syringa, Jacaranda, Bugweed and Lantana. All of these species are on the alien invasive list, and although established trees such as Jacarandas need not be removed, home owners are nevertheless required by law to remove alien invasive plants from their properties. This is easier said than done, especially if one has a large plot or farm where an alien species has taken hold. But for most gardens home owners should be able to manage the weeds in their gardens, it just takes a little knowledge and a proactive approach. Screening is one of the most common requests we get, and is sometimes the easiest problem to correct. Depending on the height you are trying to cover, there are usually many plant options available. Keep in mind that if you are going to screen off an area using plants, then you will need to be patient whilst the plants take root and begin to grow. This can take years, especially if the height you need is greater than 3 meters, but it is a rewarding process as you then end up with a natural screen as opposed to a raised wall, which can feel hard and unnatural. Keep in mind too that most plants are unlikely to provide a complete screen – you still might be able to see through their foliage – and that screening in a shaded area tends to take longer due to the slow-growing nature of most shade-loving plants. If lack of water is a problem for some gardens, then even more damaging is the over-watering of a garden. Some home owners feel the need to put down so much water on their gardens – via their irrigation systems – that they end up compromising their plants and their gardens. We’ve met home owners who water their gardens twice a day, every day, which is simply a waste of water and is hugely damaging to their plants. Over-watering a garden results in a range of problems, including the increased risk of fungus and disease, the leaching of nutrients from the soil, and shallow root systems of trees. Often, if a tree falls over during the rainy season, it’s because its root system was not deep enough, a symptom that it had been over-watered by an irrigation system. Many tree species also go dormant in the winter months, and require much less water or no water at all. The key to avoiding over-watering your garden is to understand the precipitation rates of your sprinklers, and to water the garden accordingly. 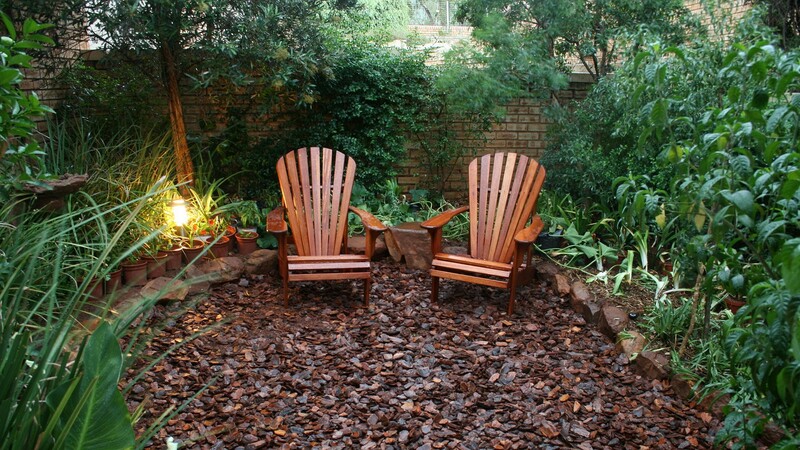 The recommended precipitation for a garden on the highveld is 25mm per week, which should be applied evenly over the course of a week, and only every second day – which allows your plants to have a ‘day off’. Furthermore watering should be reduced by 70-100% during the winter months, when many plants go dormant. Keep in mind that lawn will be your thirstiest plant, whilst an established indigenous bed will require less water, and should be watered accordingly. 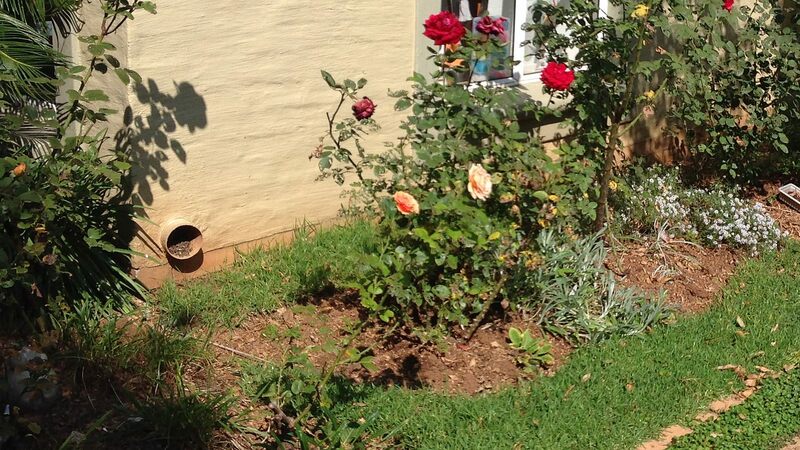 At this drought-stricken time in South Africa it’s vitally important that we all become water-wise, which we can do through good gardening practices, and the efficient use of the water we have. For further reading read our over-watering article here. Lack of a mowing edge (left) can make it difficult for your gardener to maintain the ‘line’ between your lawn and your beds. Adding a mowing edge, such as cobbles (right), solves this problem. One of the goals of a gardener or garden maintenance team is to keep your garden looking neat, and one of the ways to do this is to ensure that there is a neatly clipped line between your lawn and your beds. Unfortunately, this can cause problems for gardeners, as they often have to use a spade to keep the edge of the lawn straight, which results in the lawn slowly being chipped away at until your beds have increased in size! Lawn, by definition, is an artificially manipulated plant, and if you have not defined its boundaries then you are always going to struggle with this problem. Instead of blaming your gardener for increasing the size of your beds, make his or her life easier by edging the beds with an edging material. Some of the options here include rocks, sleeper wood, or a cobble edging – preferably cemented in place. There are also commercial products on the market (made from steel) which are specifically designed for this purpose. Using one of these solves this problem immediately, allowing everyone involved in the upkeep of your garden to know where the lawn ends and where the beds begin. LEFT: Poor quality cabling such as this can cause numerous problems in irrigation systems. RIGHT: Irrigation trenches should be dug to a minimum of 400mm. Here, our new irrigation trench (dug to 600mm) has been dug below the pool and old irrigation piping. The problems (and solutions) associated with irrigation systems would fill an entire article on their own (read our irrigation problems and solutions article here), but broadly speaking a faulty or inefficient irrigation system is one of the common problems we encounter in gardens. More often than not, the problem can be traced back to poor design or poor installation, where shortcuts are taken to try and ‘save’ the home owner costs. 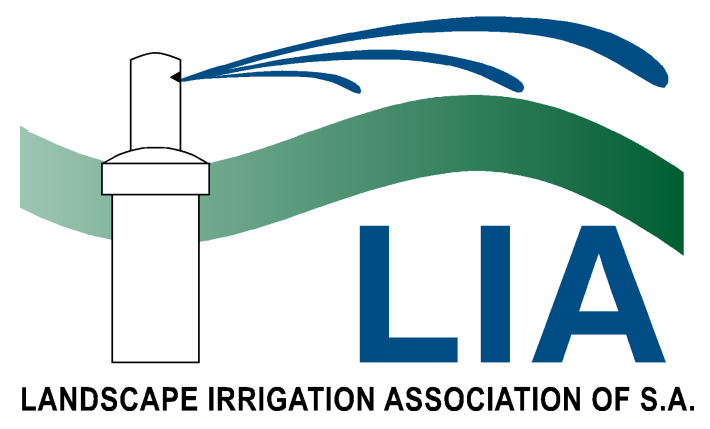 Irrigation is a competitive and unregulated industry, meaning anyone with a basic knowledge of water and pipes might be able to install it for you. Unfortunately, this often results in home owners choosing a cheaper installation, without realising that the system might cost them more in maintenance than the expense they’re paying for the initial outlay. 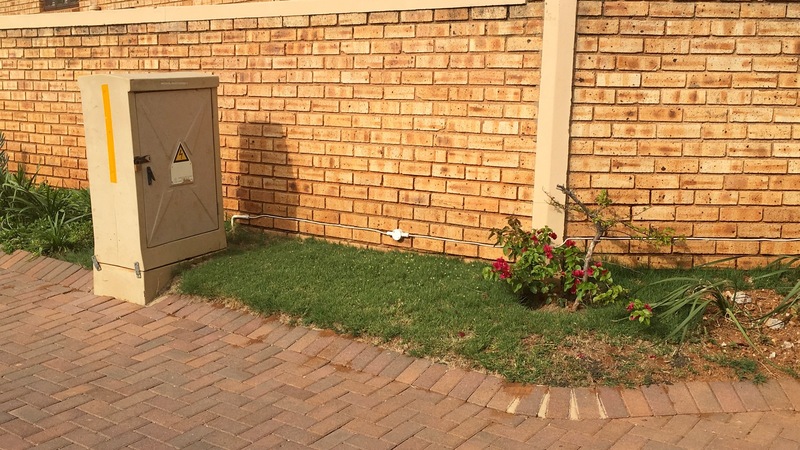 Common problems with cheap installations include poorly trenched pipes (the most labour-intensive part of the process), cheap cabling, or lack of head-to-head design, resulting in over or under-watering of certain areas. Poor trenching in particular is a major cause of punctured pipes, and one can hardly blame a gardener for puncturing a pipe that has only been trenched a few centimetres below the surface. As a general rule – and unless there are extenuating circumstances such as rock or house foundations – pipes should be trenched at least 400mm below the surface, and pop-ups then fitted by means of swing-joints or flex pipe. For cabling a minimum of 1mm GP wire should be used, and cables placed in a protective conduit. Finally, all systems should employ head-to-head principles to ensure even precipitation over an area, unless there is a narrow bed to be watered where an alternative sprinkling design can be employed. An irrigation system, if correctly installed, can be the most efficient way to water your garden, but it’s imperative that it is installed correctly, through good design, quality products, and appropriate trenching. One of the most common problems home owners encounter – usually at the start of the rainy season – is that of poor drainage. Drainage, in general, is an issue that can be traced back to the construction of the house, as all homes should have some kind of plan in place to cater for it. It’s a relatively simple problem to solve, but can be costly if it has to be done after the building is complete, as trenches may need to be dug or paving lifted to lay the underground pipework. By law you are also required to accept your neighbours rain water, which can exacerbate the problem. Drainage problems however can be solved through a combination of methods, either by laying underground pipes (usually 110mm PVC pipes), by changing the layout of your garden, or by collecting the rainwater through rainwater harvesting. 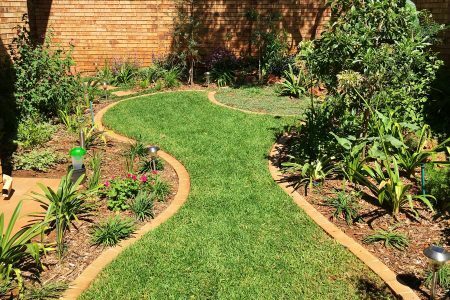 Laying of underground pipes is the solution most home owners opt for, but equally as good can be the replacement of lawn with an indigenous garden bed. Many home owners find that simply by removing their lawn and replacing it with a bed, their drainage problems disappear, because beds have a much better infiltration rate than lawn (see point 2 above about not turning the soil!) This is why soak away areas are often part of a landscaping design, allowing rain-water to literally ‘soak away’ into the ground. The third solution is to capture the rainwater through rainwater harvesting, which allows you to use the water later for your garden, or, if treated and correctly filtered, for your home. In short, drainage is usually easily solved, so consider one of the three options above if you have this problem. As indigenous landscapers, we find that very few pests and diseases attack the plants we give our clients, and those that do often form part of the natural lifecycle of the plant. The garden Acraea butterfly (and larvae) is a good example. Its host plant is the Kiggelaria africana (Wild Peach), which the butterfly lays its eggs on. When the eggs hatch an eruption of black caterpillars appears on the leaves, slowly eating away at the leaves until they can strip the tree bare! But this is a natural process for this tree, and it soon bounces back with a healthy, fresh set of the leaves. The caterpillars in turn are food for cuckoos, which enhances the wildlife in your garden, and caterpillars that don’t get eaten soon pupate and turn into butterflies again. These are therefore not pests, but rather insects that form a natural part of the food chain and the life-cycle of our indigenous plants. But there are some true pests which we encounter in gardens on a regular basis, and intervention of some kind in required for these. The Amaryllis lily borer (Brithys crini) is one example. The moth of this species lays its eggs on some of our most prized plants, specifically clivias and agapanthus, where the worms then hatch and bore into the leaves. Left unchecked the worms bore further down the leaf and into the bulb, where they damage the bulb and may kill the plant. A large infestation of this species is a serious problem in a garden, and can cause havoc on a grouping of clivias. Because the worms are poisonous and unpalatable they have very few predators, at least here in South Africa, and have become a major problem in gardens around the country. To resolve this problem many home owners resort to using pesticides, but a better alternative is manual intervention, where you take the place of a predator and manually remove the infected leaves and kill the worms. This is a time-consuming (not to mention squeamish) process, but it is rewarding as it not only solves the problem but avoids you having to put down pesticides in your garden, which can compromise the wildlife you do want. Another regular problem we encounter is aloe scale, a white scale insect that has proliferated throughout Gauteng and turns the leaves of your aloes white. These insects are sap-suckers, and if left unattended will eventually kill the aloe. There are multiple interventions to them, most of which involve cleaning the scale off with a soapy liquid and soft brush – or a high-pressure hose – and then spraying over the infected leaves with a layer of oil, either cooking oil or a product such as Oleum. This suffocates the insects, and the plant eventually recovers. Soil preparation is the key to a flourishing garden, but it is often neglected because it is time consuming and labour intensive. If you are planting a new garden good soil preparation is vital, as it is the foundation into which your plants will grow. We frequently encounter gardens where the soil has been inadequately prepared, or not prepared at all, leaving the home owner with costly expenses because the lawn and plants they have put into their garden struggle to grow or may even die. To prepare the soil, dig the area to a depth of 30-40cm, and remove any foreign objects such as rocks or rubble. A generous layer of compost should then be applied – about 1x 60dm bag per four square meters of surface area – and work this into the soil with a garden fork. Bonemeal and organic fertiliser can then be added if required, and once this has been done you are ready for planting. If you have an existing garden and want to add compost, do not dig this into the garden, as this can disturb the roots of your existing plants. Rather simply spread the compost on top of your soil, where earthworms and other organisms will then naturally break it down and work it into the soil for you. This is a problem we frequently encounter in gardens, and one which we have written about before. 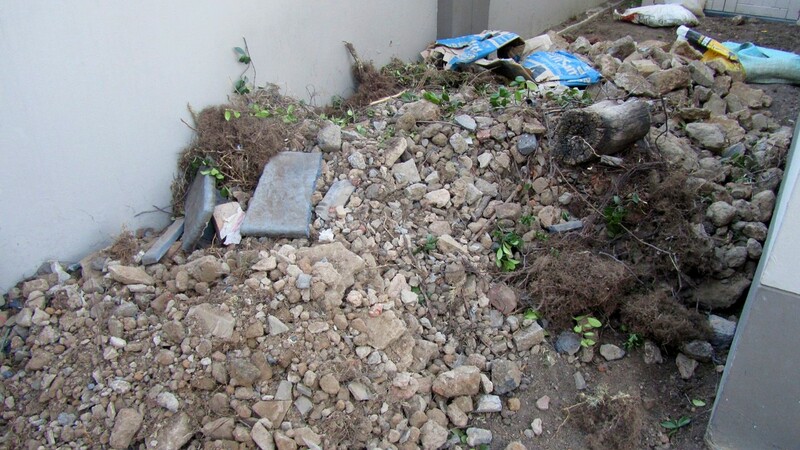 Rubble is something that is not apparent to a home owner when they buy their home, and may only be discovered later when the garden is dug up in preparation for gardening. In small townhouse complexes rubble under the ground has become a major problem, and is the result of building contractors taking shortcuts by dumping it in the garden instead of removing it from the property. Lawn is then planted over it, and once the contractor leaves no one is any the wiser. Unfortunately, rubble in the garden limits the growing space for your plant’s roots, resulting in the plants struggling in a particular area or continually dying off. We’ve encountered homes where a home owner tries to plant trees but finds that the young trees keep dying. Only when we dig below the surface to prepare the ground, do we find that the garden is full of rubble, and the trees were trying to root through this. Fortunately, there are building contractors who are ethical and follow best practice in this regard – protecting the topsoil during their building work, and many estates now enforce rules regarding rubble and topsoil. If you think you have rubble under your lawn, you’ll need to remove it, probably manually with a large gardening team, before you can reap the benefits of a beautiful garden. Lawn, as we have mentioned, is likely to be your highest maintenance plant, and limiting it in your garden can save you maintenance and watering costs. But if you do have lawn in your garden, then it is important that you look after it seasonally to ensure it remains healthy. 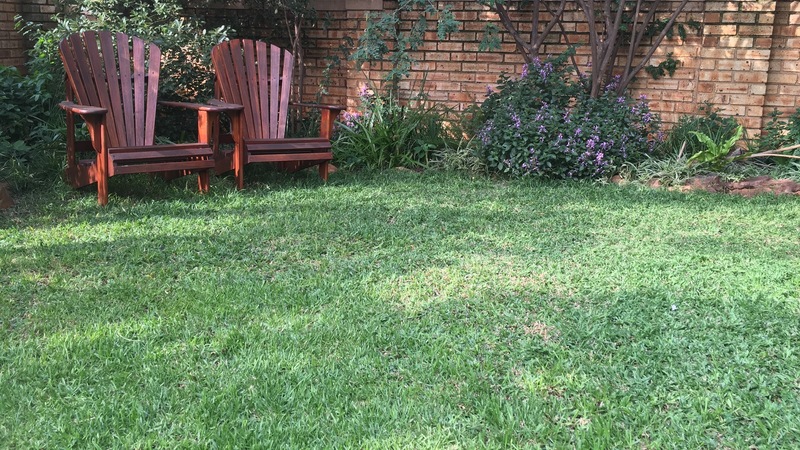 Kikuyu is the most common lawn on the highveld, and we frequently encounter gardens where it has not been maintained or adequately cared for. Apart from regular mowing, watering and weeding, a healthy lawn requires additional maintenance which may include regular fertilising, scarification and hollow tining. Dogs can cause havoc in a small garden, digging up plants and damaging the lawn. Part intervention and part compromise is usually required. I have left this problem for last, specifically because it is one of the most difficult to solve. Dogs are not only our pets, they’re family, and allowing them to roam freely in the garden allows them to dissipate all of that excited energy they have within them. Unfortunately, especially in small shady gardens – dogs can cause havoc to lawns and our plants, either digging holes or pulling the plants out. Sometimes dogs will pull out plants that you have planted yourself (as opposed to plants planted by someone else), which might be a sign that they are competing with the plant for your attention! (Perhaps a dog expert can answer this?) 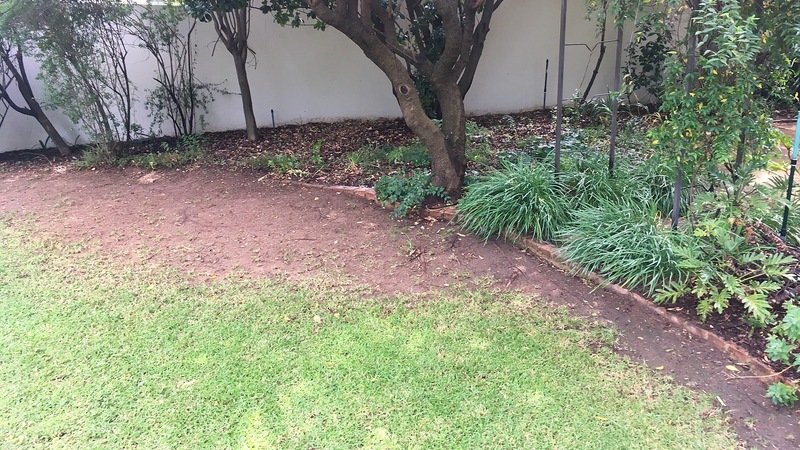 A small garden that has been dug up by your dogs can become a serious problem in the rainy season, especially if your dogs bring half of that soil into the house! We have managed to solve these problems somewhat by planting unpalatable plants (Dietes sp. seem to work), or placing dump rock in the garden – which is usually not aesthetically pleasing. Spiny plants, or foul-smelling plants are not as successful, and dogs can get quite creative in getting around these. Other interventions – though more expensive – are electric pet cables, which issue sound alarms or small shocks to your dog, thereby teaching them to stay out of the beds. We’d welcome feedback on other solutions too that home owners have found to work, as this is a common but frustrating problem for many home owners. These are gardens that lack a theme, a problem that usually stems from the lack of a design. Although it is tempting to buy one of each plant at a nursery (usually plants that are in flower), and place them in your garden, this can lead to a garden that seems to be ‘a bit of everything’, and doesn’t cohere well. It can also create the problem of having plants with differing water or light requirements next to each other, resulting in some flourishing and others failing. When creating your garden it is worth choosing a theme (e.g. bushveld/forest/woodland/grassland/succulent/water), and then creating a design with plants that are appropriate to this theme. From here you can also quantify and space the plants appropriately, and then implement the garden in phases as your budget allows. A theme and a design provides you with a template to work from, and helps you to create a beautiful, integrated garden. We frequently encounter gardens where lawn, for one reason or another, is being kept in a difficult to reach place. 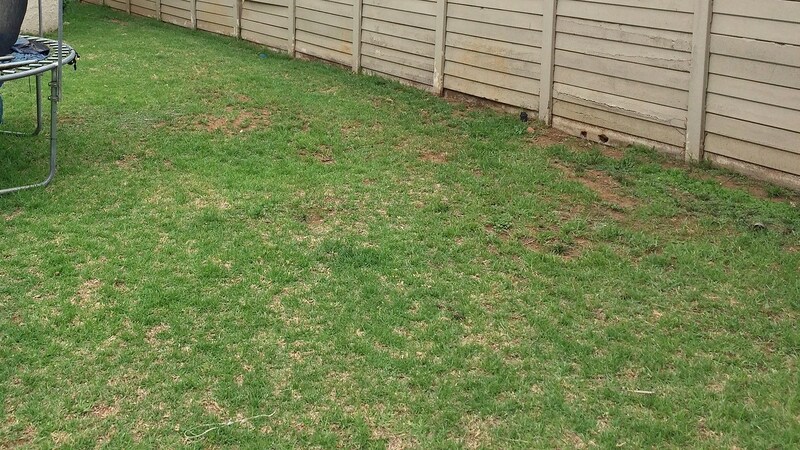 Sometimes this can be between a bed and the boundary wall, which requires the gardener to somehow get the lawn-mower or weed-eater into this area in order to maintain it. 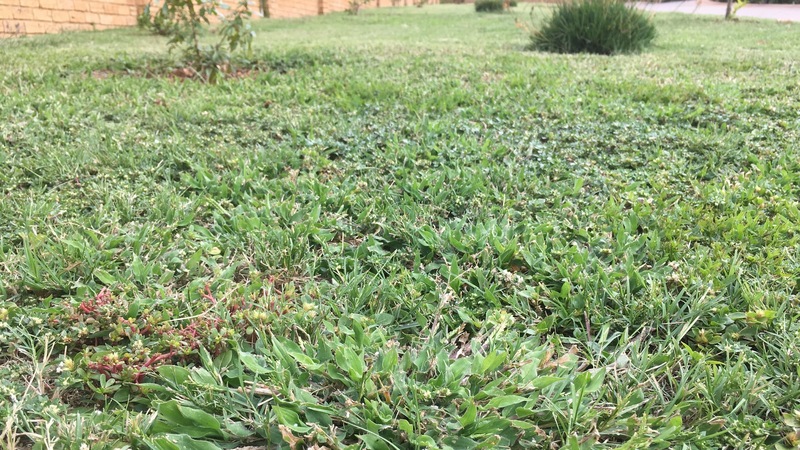 Some home owners leave the lawn there because they cannot think of anything else to use, when in reality a low-growing groundcover would be more appropriate, relieving them of what is essentially a maintenance headache. Think about all the spaces where you have lawn in your garden, and consider whether you really need it there or not. One frequent complaint we receive from home owners is that certain plants in their gardens are too messy, either dropping too many leaves, or flowers or fruit on their freshly cleaned paving or outdoor seating area, or in their pool. It’s true that some plants are more problematic in this regard than others, and generally one needs to either live with this problem or remove the problem plant. 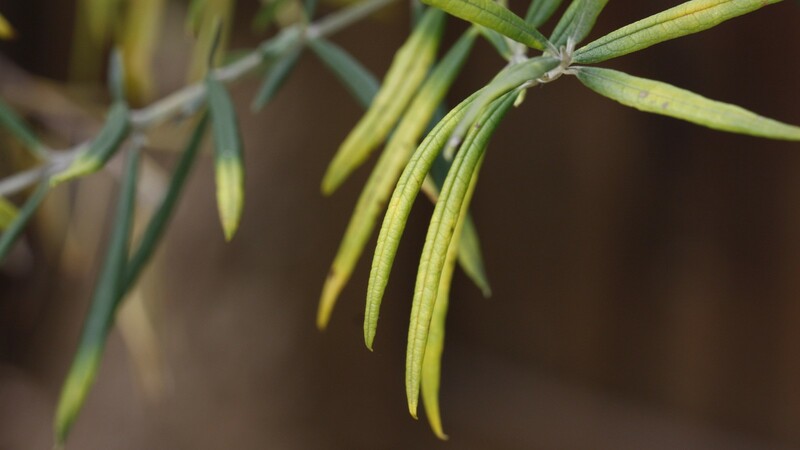 Often the plant in question is an evergreen tree, and some of our most beautiful evergreen trees are the messiest of all, since they lose their leaves all year round – don’t be fooled by the word ‘evergreen’. If you have a messy plant, you will either need to cut it back to a manageable size, or replace it, or accept it as part of the garden. Gardens such as this are challenging and require some creativity. Low growing succulents are worth using provided there is sufficient rooting space. 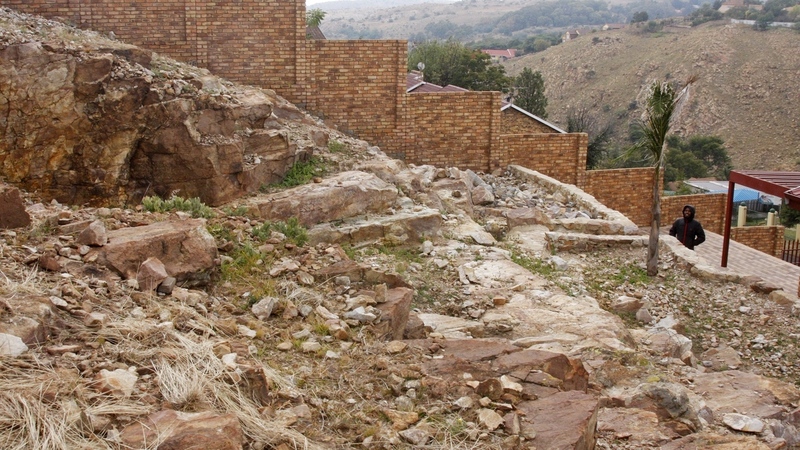 Having a garden that contains natural rock can be a benefit to the home owner, by providing a unique ‘rocky outcrop’ habitat that other home owners try to artificially replicate. Additionally there are many indigenous plant species that one can use in such a scenario, provided there is sufficient soil in the area to work with. Unfortunately though, some of the gardens we see have so much rock that it leaves the home owner perplexed as to what to do in order to create a beautiful garden. In these cases one generally has to be creative in solving the problem, either by building artificial planting spaces, or decking over the area and making use of potted plants. Sometimes one might be able to jack-hammer part of the rock away, provided it is practical to do so and is not going to compromise a boundary wall or foundation. If you live on a rocky ridge you might be able to create a succulent garden, and often this can result in a unique and rewarding layout. For most gardens built on rock though, a little bit of creativity is usually required to solve the problem. Once in a while we are consulted by home owners who are concerned that they may have poisonous plants in their gardens, which are affecting their children or their pets. These cases are few and far between, but it can be a concern – especially if your little ones are constantly ‘taste-testing’ your garden! In most cases we find that the problem plant(s) are exotics, and some species are notoriously problematic. 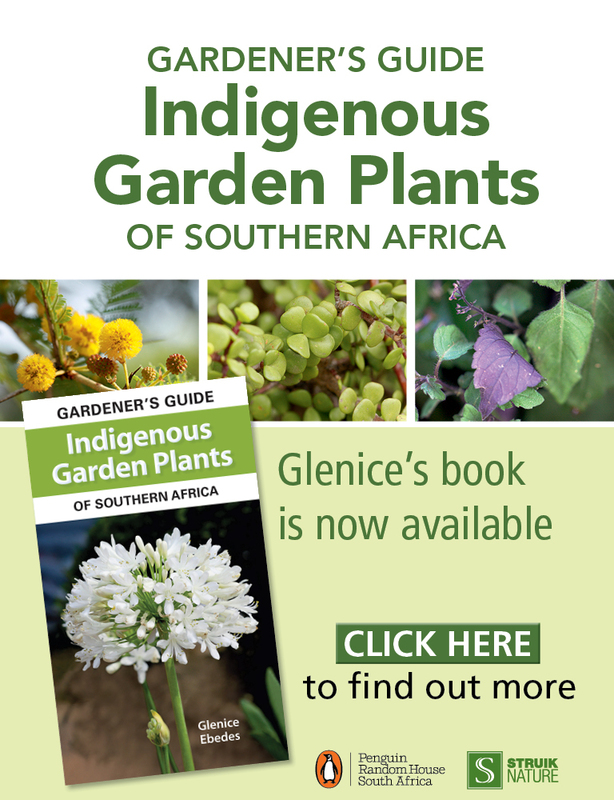 Unfortunately many exotics, like Melia azedarach (Syringa) and Solanum mauritianum (Bugweed), have proliferated throughout Gauteng, and are difficult to control, so proactively weeding them out from your garden is likely to be an ongoing process. If you are concerned that your pets or children may be negatively affected by plants in your garden, consult first with an expert to catalogue the species you have, and once you have this list you can then make an informed decision as to which plants may need to be removed. Hail damage to your plants can be a painful experience to go through, especially if you have worked so hard to get your garden looking picture perfect! Unfortunately there isn’t much you can do about this problem, but the good news is that plants are resilient, and most will recover quickly from hail damage, sending out a fresh set of leaves. Accept hail damage as simply a part of nature, and remember not to throw away all those fallen leaves – as mentioned already they act as a perfect mulch to help rejuvenate your garden! I find that the sand used to fill in ponds is usually lacking in nutrients and requires a lot of additives to make it a suitable growing medium. Although it involves a lot more work to remove it and replace with a quality soil, you’re likely to reduce the risks of harm to your plants and wildlife. I need a list with pictures of weeds on lawns on the Highveld. Small green leaves, flat, tiny lightpi k flowers. Tried Efekto Banweed. No luck. 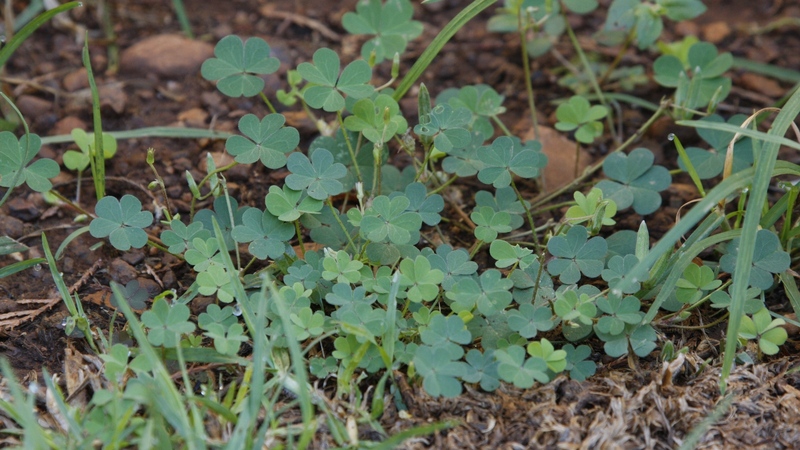 It sounds like you have clover (Trifolium sp.) in your lawn and the herbicide you’ve tried is not effective for that. We prefer not to use herbicides and rather go through the process of manually removing weeds. It is time-consuming, but a very effective method with the least impact on the environment. The key to keeping weeds under control is to remove them before they flower and seed as they will spread rapidly. Mowing a lawn with weeds worsens the situation as the mower spreads the weed over a larger area. Also avoid sharing implements with other gardens as the seeds may be transferred from another garden. Very interesting. Would like some more on clivias though. We’ll add more on clivias in future articles.